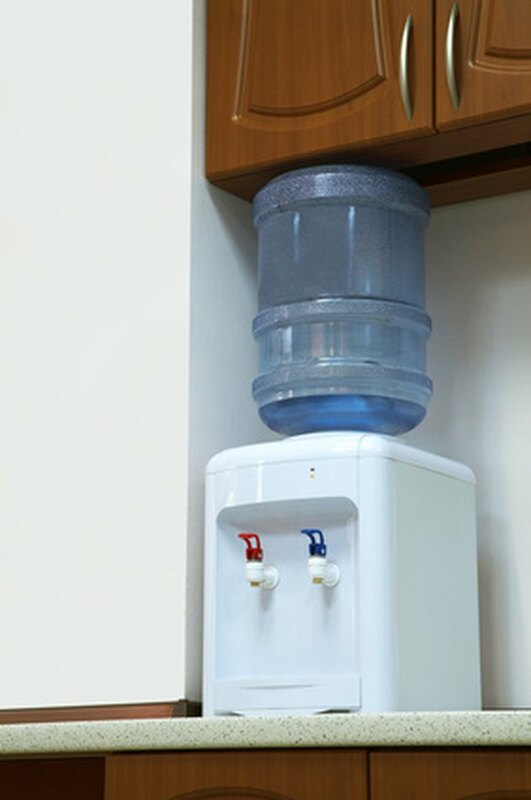 A bottled water dispenser in the home gives you access to a clean water supply. These dispensers are preferable in many homes since well water and tap water often contain chemicals and other elements that people simply do not want to ingest. Purchasing single-serving water bottles is an option, but this is wasteful since it necessitates throwing away dozens of empty water bottles each week. Instead, use a bottled water dispenser and clean it every month or so to keep bacteria out of the unit. Clean your water dispenser cooler with bleach. Place a pair of rubber gloves on your hands, unplug your water cooler and remove the water bottle. Discard any water from the bottle and refill with 1 tbsp. bleach per gallon of hot water, filling the bottle halfway. Place your hand tightly over the bottle opening, and shake the bottle for about 30 seconds. Flip the bottle over and onto the water dispenser, and place a bucket under the dispenser faucet. Release all water from the bottle through the faucet. Remove the water bottle from the unit and rinse out the water bottle with hot water. Fill the reservoir of the dispenser with hot water and discard through the faucet. Repeat this four times to be sure all bleach solution is flushed out of the unit. Wipe down the faucets and handles with a damp sponge.